The Western Ohio Region and the Cincinnati Region SCCA held a region challenge event at Traders World this weekend. It was cold. Probably not the best day for an autocross event, but it was a lot of fun, and had decent turn out. We ended up just enough number of drivers to run an event, and we started our Winter-Cross. The surface started out with no traction at all, but as the day goes, we start having a little bit of grip here and there. We had total of 8 Runs on Saturday, and though I pushed a bit too hard on my last run to loose some time, my 7th run was good enough for winning the Street Open class, and some how I made it to Top Pax for the day! Sunday turned out a little better. It was still very cold, but no rain, no snow. One thing I learned… I really miss my Bridgestone RE71R. I’ve been running BFG Rival S 1.5 for last half season or so. They are great tires, and it may have a little more grip, being 225 width compare to 205 on RE71R. However, BFG is a little less communicative compare to RE71R, and for my driving style, I appreciate all the feedbacks that RE71R gives me. I could comfortably push the tires to their limits, and probably I end up going faster around the course. Because of the cold weather, I didn’t want to use my newer BFG, and I brought back my last year’s RE-71R. It’s been through one winter in cold garage, and been daily driven here and there this year. 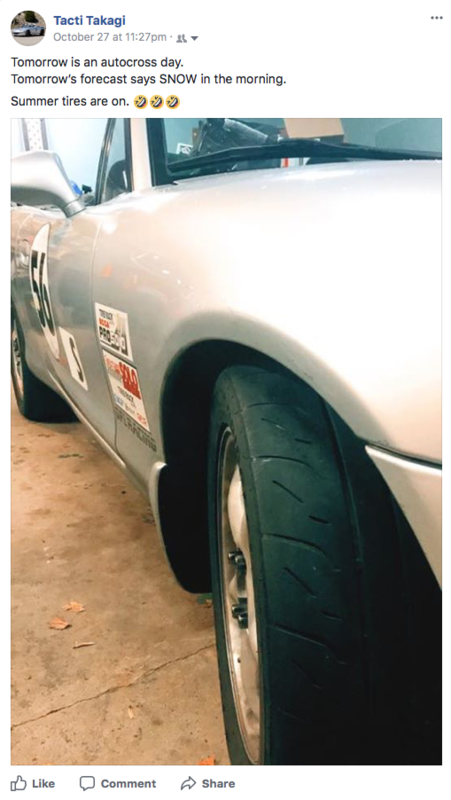 They have so much less grip compare to their potential as new, yet I felt more comfortable driving it this weekends than I’ve been with BFG last few events in nicer warmer weather… Not saying BFG is lesser tires. It’s more of the driving style of mine fits better with RE71R. Finally, while editing my Virb360 video, I found this cool effect. This does not help analyzing my driving at all, but I think it’s pretty cool and fun angle to watch autocross!